Bring elegance to your family gatherings, dinner parties and banquets with these stylish basket weave textured charger plates! Perfect for any occasion from dinners to parties, weddings, bridal showers, baby showers, anniversaries and more! The dinner plates are 13" diameter and made with polypropylene. Hand wash only. (For decorative use only: do not put food directly on the charger plate.) 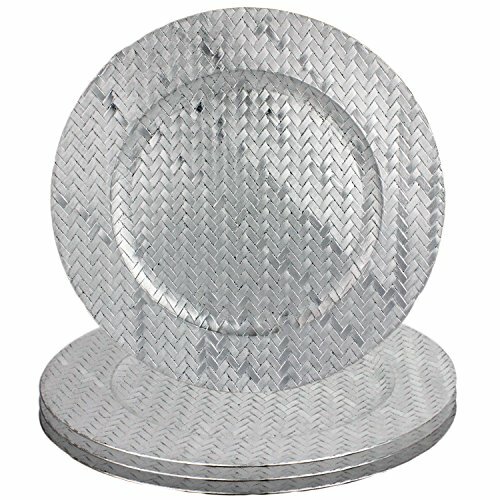 Enhance your holiday happenings for Valentine's, Thanksgiving and Christmas with these basket weave patterned plates. Perfect to use with fine china. Great for wedding planners, event planners, caterers and restaurants.